The other day, a friend told me indignantly that those opposing the TPPA are “anti-free-trade”. I believe this is due to the common narrative about the TPPA — that it is only a free-trade agreement, but this is misleading. Only 5 of the 29 chapters of the TPPA concern trade. The remaining 24 non-trade chapters are the “quid pro quo” of the deal, and therein lies my point. This is a cost-benefit issue; it is not simply an “anti-free-trade” debate per se. So what are the costs? The answer is, whatever is in the other 24 chapters. And that is highly secretive information that only the 600 multi-national corporations who have contributed to the text (and the negotiators) are privy to. Thousands of protesters demonstrated their objection to the TPPA in August. Here they send a message about the lack of public consultation regarding the treaty negotiations. Some of the information in the 24 chapters has been leaked and is being criticised by broad groups of national and international health and legal experts, including senior medical specialists, Nobel Laureate economists, climate scientists, international human rights experts, and members of the public. 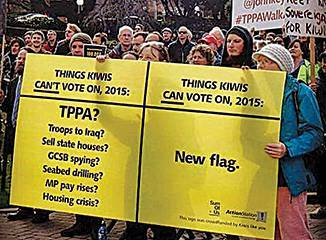 All of them are included in the 25,000 New Zealanders protesting against the TPPA. We are being assured that the eventual ~$5 billion pa profit claimed by Trade Minister Groser is going to be well worth it. But hang on again. Where did that figure even come from? Bertram, who is scathing about this claim, says “This profit is propaganda and is completely unsubstantiated. Groser and other Government officials are parroting the information originally provided by Petri from the Peterson Institute in Washington”. And there it is. We’re negotiating this agreement based on predictions of one analysis done in America some time ago. “These big sounding numbers have generally been taken at face value by political commentators and the media, with very little investigation into to how they were derived, what assumptions underlie them, and what crucial issues may have been left out of the calculations” says Bertram in his research paper — the only comprehensive analysis done in New Zealand by a New Zealander, about the TPPA gains and costs. Bertram said the Peterson Institute has never come back with a rebuttal of his paper which was published over a year ago. The best thing we can do, according to many informed, qualified and researched opinions is to walk away. There is too much at stake, especially as the TPPA is binding. 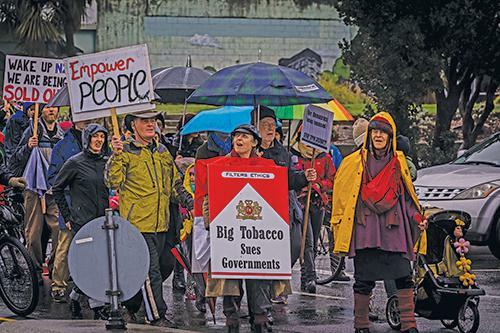 TPPA Protesters graphically demonstrate the effect tobacco companies may have on the Government.